Through the Bible the Lord speaks. From generation to generation His people hear His voice and they respond to His calling. God has given each and every one of us a gift, ability, talent and we unite together as His children and are one to serve the same Lord, the same God who works all in all. Our goal is as we equip ourselves with the Word of God, that we may encourage others and learn from those who with courage stepped out of their comfort zone to make a difference in their community and beyond. This journey began with one trip to the Dominican Republic and one visit to the Fundacion Proyecto Ayuda al Nino (Project Help a Child Foundation) Casa De Luz (Lighthouse) Orphanage. 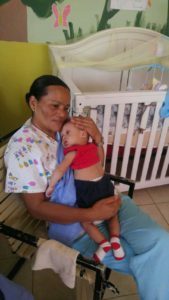 These are Christian organizations with the purpose to help children that are displaced, orphaned in the Dominican Republic and meet the physical and spiritual needs they have. The orphanage is a home for 40 kids that have special needs. These children originally were found living in very poor conditions. Lucas Carrajal, took courage through prayer and with little resources but with great love and compassion took these kids under his wings. His step of faith, his actions have touched the hearts of many including mine. Many have come together and by the grace of God these children are in a safe, clean environment. Since then, we have returned several times encouraging and learning from others with God and His Word at the center of it all. Some of the things that have taken place during our time together in the Dominican Republic are listed with a short description. 1. Maintenance – This includes painting, cleaning and construction. The orphanage currently has several buildings on the property that are unfinished. Looking forward to possibly finishing those buildings to provide space for things such as a therapy room for the children. A greenhouse has also been built. 2. Food Distribution. 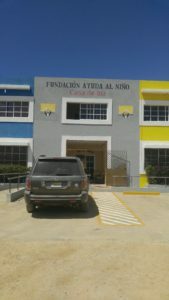 The orphanage sits in a very poor area of the Dominican Republic. 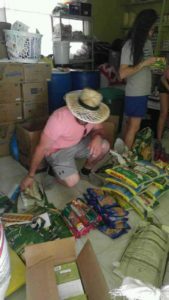 Through the food distribution we are able to share the message of God’s love for all people, distribute food items such as rice and beans, items donated from the Sewing Seams for God Sewing Ministry. The sewing ministry has provided pot holders and handmade bags to carry the food. Lastly and most importantly, hand them a Bible in their language. 3. Kid Time. Some of the children are bed bound or are able to move around in a wheel chair. Sitting with them and helping nurses care for them is a huge blessing and encouragement for both. Others can play at the playground, color, and do crafts. Spending time with them and giving them attention is a way to display God’s love. We are blessed and honored to serve the people of the Dominican Republic. The Bible reveals God’s attitude towards orphans and widows. He loves and cares very deeply for them. God commands us to protect and care for orphans and widows.